This course has been offered in 2016 and 2017. The next offering has not yet been scheduled. A Pendle Hill 12-week online course for people who want to learn more about the simple, radical, and contemporary spiritual path of Quakers, and explore its relevance to their own spiritual journeys. It will be of particular interest to North American seekers, especially those attracted to US and Canadian Quaker congregations that practice silent group worship, do not have paid pastors, and try to lead faithful lives of simplicity, integrity, nonviolence, community, sustainability, and justice. In this tradition, we believe every woman, man, and child on this planet has the capacity to directly experience divine love, presence, and guidance. We also believe that if we listen carefully to this “still, small voice” of God we can find the wisdom and power to help heal our personal lives, our families, our communities, and we hope, someday, the world. This course, taught by Marcelle Martin and assisted by Steve Chase, runs from January 9 through April 5, 2017. “Exploring the Quaker Way” is for seekers, attenders, and members of Friends meetings who want to: 1) deepen their understanding of the “unprogrammed” Quaker tradition; 2) better understand the spiritual journey common among early and current Friends; 3) reflect on their own spiritual journeys within this simple, radical, and contemporary spiritual path; and 4) become more familiar with key elements of fostering vibrant and caring Quaker communities. It is designed for people who want to explore these themes through personal reflection, focused study, and deep dialog within a lively learning community gently guided by seasoned Quaker teachers and guest presenters. The course will be taught by Marcelle Martin with assistance from Steve Chase and a few special guest webinar presenters. 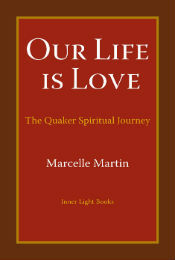 Marcelle Martin is the author of Our Life is Love: The Quaker Spiritual Journey, published by Inner Light Books. She has led workshops at retreat centers and Quaker meetings across the United States. 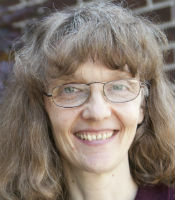 She was the resident Quaker Studies teacher at Pendle Hill for four years, and was a core teacher in the School of the Spirit’s “The Way of Ministry” program. She is the author of the Pendle Hill pamphlets Invitation to a Deeper Communion (PHP #366) and Holding One Another in the Light (PHP #382). In 2013, she was the Mullen Writing Fellow at Earlham School of Religion while working on her book. On her blog, “A Whole Heart,” she writes about spirituality today, taking inspiration from the past to help us find the courage to become all God has created us to be in our day. Steve Chase is a member of the Putney Friends Meeting in Vermont. 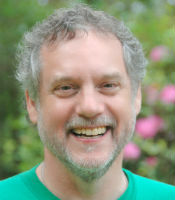 He has traveled in the ministry since 2011, including serving on the US Quaker Quest Training Team. 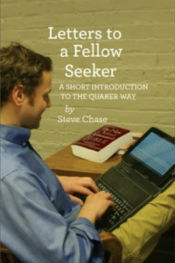 He is the author of the book Letters to a Fellow Seeker: A Short Introduction to the Quaker Way and the Pendle Hill pamphlet Revelation and Revolution: Answering the Call to Radical Faithfulness (PHP #431). Several of his articles and essays have appeared in Friends Journal, Quaker Life, Western Friend, and Sojourner. He has also taught several online classes at Antioch University New England. A two-week online orientation period will run from January 2 through 14. This will allow students to log onto the course website, update their personal profiles, download a detailed course guide, read the first course reading, take an online posting challenge, and post an introduction. The main body of the class will begin on January 15 and run through April 7, 2017. Besides reading and discussing online an average of 50 pages from common course readings each week, students will also work most weeks on an additional reflective or experiential exercise. Each student will then discuss what they are learning from these assignments on the phone with at least one other student. Online videos will also be included as part of the program, as well as up to six presentations via live webinars. In the second half of the course, each student is invited to study some supplemental resources on a self-chosen topic and then lead a seminar presentation and discussion on their chosen topic in a student-led webinar. Tuition for this 12 week online course is $500. This tuition covers the instructors’ honoraria, the online learning management system, the video conferencing/webinar module, and ten Pendle Hill pamphlets that are available for download by students on the course site. If local Quaker meetings have two or more members participate in this course, significant group discounts are available. We encourage people who need financial support to cover any of these costs to reach out to their local Quaker meetings for possible scholarship assistance. Two main course books will need to be purchased separately. The book Letters to a Fellow Seeker by Steve Chase runs $12.95, plus postage and handling, and Our Life is Love by Marcelle Martin runs $17.50 plus postage and handling. Both can be purchased from QuakerBooks. Listening Spirituality, Volume II by Patricia Loring is a recommended supplemental book. It may be available in your meeting library. (It deserves to be in every meeting’s library.) If not, you can also order it from Quaker Books for the special price of $25.00. An up-to-date web browser (Mozilla Firefox is highly recommended and available online as a free download). Post an introduction of yourself. Take part in an hour long phone call or face-to-face meeting with one or two classmates to discuss the personal exercises. If you can’t participate in a live webinar, watch a recording of it soon after. Are comfortable with the computer hardware and software needed to participate in the course. If these characteristics describe you, then this course will likely serve you well. If not, you might be better served by a face-to-face educational offering. Registration will run from December 1, 2016 through January 9, 2017. The course will be capped at 30 students, so signing up early is advised. People who try to register after the first 30 students have signed up and paid their tuition fees will be placed on a waiting list, and if they are not admitted will be given advance notice when the course is offered again. Registration is now closed for the Winter 2017 offering of the course. A $50 processing fee is charged for all cancellations. Cancellations made at least 14 days before the start of the program will result in a refund. Cancellations made between 14 days prior to — and 7 days after — the start date of the program will result in a credit toward another program or stay at Pendle Hill up to one year after the start date. No credit or refund will be given for cancellations made after the first week of the course. If you have any additional questions, please contact Steve Chase, Director of Online Education, at 610-566-4507, ext. 123.